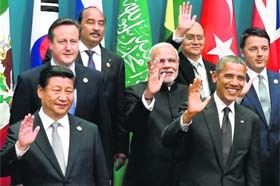 BISBANE: The G20 Summit today endorsed India's line on the need for transparency and disclosure of tax information as PM Narendra Modi sought a new global standard on automatic exchange to tackle the issue of black money. FUZHOU: In a historic day for Indian badminton, Saina Nehwal and K. Srikanth clinched the women's and men's singles title of the China Open Super Series Premier, respectively, here on Sunday. TARN TARAN: Charging successive Congress-led governments at the Centre for depriving Punjab of it's Capital, CM Parkash Singh Badal today said time has come for Narendra Modi-led government to make Chandigarh the Capital of the state. BEIRUT: A new graphic video by the militant Islamic State group claims that US aid worker Peter Kassig has been beheaded. BARWALA: Tension mounted outside the Satlok Ashram complex near Haryana's Barwala town on Sunday as troopers and hundreds of police personnel surrounded the complex of self-styled godman and sect leader Rampal. SRINAGAR: Mehboob Beg, a senior National Conference leader and its candidate against former Jammu and Kashmir Chief Minister Mufti Muhammad Sayeed, withdrew from the contest on Sunday. The Narendra Modi government is planning to bring about major changes in the Consumer Protection Act, 1986 to benefit consumers in the hitherto complex and largely seller-advantageous complaints redress system. Union Minister of State for External Affairs General VK Singh (retd) on Saturday said the BJP hasn�t shelved the controversial issue of abrogation of Article 370, which accords a special status to Jammu and Kashmir, but is ready for a discussion on it. Prime Minister Narendra Modi today pitched for global cooperation on repatriation of black money stashed abroad as the summit of G20 countries opened here amid intense pressure from within on tackling the menace. Religious head Rampal remained holed up inside the Satlok Ashram for the 10th day today as the Haryana Police called in a unit of the CRPF's Rapid Action Force (RAF) in Barwala late on Saturday night to storm the ashram. The CRPF's unit has been stationed five kilometres from the ashram. 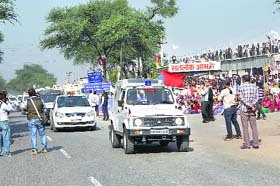 Vehicles of top Haryana police officers during a flag march outside Satlok Ashram in Barwala on Saturday. Diesel prices in Punjab are up by 77 paise as the state government on Saturday increased the VAT by 1.50%. The VAT on diesel in state was 9.75% till now. After the revision, it stands at 12.3% (9.75% + 1.50% + 10% surcharge). Amid reports of contaminated tablets being given to the victims of botched tubectomy in Chhattisgarh, Union Health Minister JP Nadda said today that doctors conducting such surgeries had not been given any target to complete.